LUXEMBOURG - NON STANDARD CARDS - Mudam Playing Cards, Luxembourg (printed by France Cartes). 200646 Mudam Playing Cards, Luxembourg (printed by France Cartes). Be The Artists' Guest: Play the Game. Massinon. Design: Jean-Christophe Massinon. 52 + JJ (all different) + title card, complete. Offset, 84x55 mm, rc, Backs: Elements of the deck, pink and white on light-blue background. 2005. Lit. : De Ryck in Journal of the IPCS 34/2, pp. 145-147. The exhibition Graphique Deluxe has invited 11 artists to create a deck of cards on the occasion of the opening of the Museum of Modern Art Grand Duke Jean. The courts display the faceless portrays of icons of the pop culture on pink (H & D) or brown background (S & C) from the sixties to the present. They are identified by their first names only. So we have "Martin" (Luther King), "Jane" (Fonda), "David" (Bowie), "Jean-Michel" (Jarre), "Louise" (Madonna), "Jeff" (Koons), "Chrissie" (Hynde) etc. The jokers display the waving figures of W and Osama. Printed in a limited edition of 500 copies. CHINA - NON STANDARD CARDS - The World Paper Products & Toys Mfy. Ltd., Hong Kong. 200759 The World Paper Products & Toys Mfy. Ltd., Hong Kong. Sky Spirit. "Ace" No. 616. Design: Dio Art. 52 + JJ (all different), complete. Offset, 88x63 mm, rc, Backs: White trellis on green background. c2005. Impressive representations of European birds in their natural environment. RUSSIA - NON STANDARD CARDS - Helium, Saratov. 200665 Helium, Saratov. Cards for little girls. 36, complete. Offset, 74x49 mm, rc, Backs: Sitting girl with teddy and picture book, in bluish tints. 2006. The little girls grow up following the value of the cards from the 6s to the aces and their occupations change accordingly. The boys as jacks and kings are in the suiting age. Nice drawings in pop pastel colors. AUSTRIA - NON STANDARD CARDS - Ferd. Piatnik & Sons for Edition Hilger, Vienna. 340371 Ferd. Piatnik & Sons for Edition Hilger, Vienna. Attersee. Design: Christian Ludwig Attersee (born in 1940). 2 x 52 + JJJ (2 different ones), complete. Offset, 89x58 mm, rc, 4 German I. Backs: Fish and bottle, yellow or blue background. Maker's name (Hilger) on AD, maker's name and logo (Piatnik) on AS. 1993. Lit. : Altfahrt in Talon 12 (2003), p. 33. Strange animals, which we interpret as a mouse in H, a goat in D, a parrot in S and a salmon in C. As kings they wear a crown, as queens they have breasts. On the jokers a kind of starfish glides over a glass. RUSSIA - NON STANDARD CARDS - Alexander Lutkovskiy (publisher), Novosibirsk. 380417 Alexander Lutkovskiy (publisher), Novosibirsk. Rare Russian Cards. 7 of Hearts. Design: Alexandr. 32 + JJ (all different), complete. Color digital printing, 61x43 mm, rc, Backs: Without imprint, white. 2003. Lit. : Eroticism VI 7.48; Lutkovskiy 4.5. Reproductions of so-called prison cards. The courts display pencil drawings in black and red of gangsters and their molls. RUSSIA - NON STANDARD CARDS - Printissa (RusJoker), Saint Petersburg. 200660 Printissa (RusJoker), Saint Petersburg. Legends of the Sea. 52 + JJ, complete. Offset, 89x57 mm, rc, Backs: Grim bearded head between 2 ornaments with lion's heads. 2005. NEW ZEALAND - NON STANDARD CARDS - Maker unknown. 200608 Maker unknown. Aotea Playing Cards. 52 + JJ, complete. Photogravure, 89x58 mm, rc, Backs: 2 Maori women standing next to the statue of a divinity (color offset). c1940. All cards reproduce B/W photos of sights. 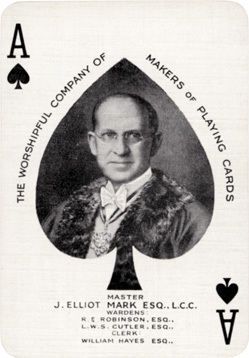 005241 The Worshipful Company of Makers of Playing Cards, London (Thomas De La Rue & Co., Ltd.) Coronation. May 12, 1937. 2 x 52 + J + EC, complete. Color lith. (Ace of Spades = relief halftone, backs = photolith. ), 90x62 mm, round corners, gilt edge, 2 English index marks. 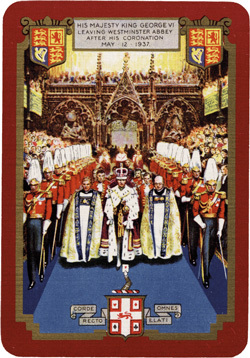 The King leaves Westminster abbey after his coronation, red or blue frame. 1937. Fournier I p. 233; Thorpe  p. 65; Berry [Taxation] W3. Ace of Spades shows the portray of the company's master J. Elliot Mark. 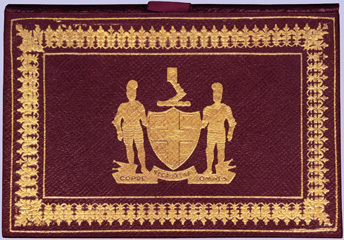 The dark-red leather box displays the company's arms in gilt. Orig. red leather box, gilt-tooled (PRESENTATION BOX), and cardboard case, the blue deck unopened, the tax wrapper of the red deck somewhat damaged, mint. BELGIUM - PACKAGINGS - Etablissements Brepols S.A., Turnhout. 200706 Etablissements Brepols S.A., Turnhout. 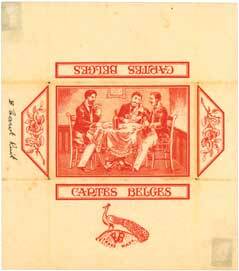 Wrapper for a deck CARTES BELGES (Belgian Cards). Card players at the table. Line block in red, 173x152 mm. Backs: Without imprint. c1925. Folding marks, small notice handwritten in ink on the side ("B Tarot Ruit"), otherwise very good conservation. GERMANY - NON STANDARD CARDS - Karl Weberpals, Planegg (diffusion). 340155 Karl Weberpals, Planegg (diffusion). The Gravedigger's Deck. Design: Martin Wolke, Kiel (born in 1971). 36 + title card, complete. Hand-col. xerocopies, 90x57 mm, square corners, 1 German I. Backs: Without imprint, white. 1991. All cards display pictures of a gravedigger with top-hat in his professional and private activities. The deck was published in an edition of 200 copies, signed and numbered by the artist's hand on the title card. CHINA - NON STANDARD CARDS - Hebei Zhuoda Poker Culture Co., Ltd.
200739 Hebei Zhuoda Poker Culture Co., Ltd. Dolls. 52 + JJJ (all different), complete. Offset, 87x62 mm, rc, Backs: Snow crystals against a background striped in shades of red. c2005. Color photos of blond dolls on all cards. They represent a young girl with very big eyes and a large chic wardrobe. Min. damaged ill. OBox, mint. JAPAN - NON STANDARD CARDS - Nintendo Playing Card Co., Ltd., Kyoto. 330445 Nintendo Playing Card Co., Ltd., Kyoto. Takeda. 52 + JJ + EC, complete. Offset, 87x57 mm, rc, Backs: View of a pharmacy from the 16th century and name of the company, brown. Maker's name on the jokers. 1966. Advertising deck of the Takeda Chemical Industries, Ltd., a pharmaceuticals producer. Each card shows historical figures and traditional costumes in B/W from all eras and countries. S and C are blue. Edition of 3500. USA - LENORMAND - Whitman Publishing Co., Racine, Wisconsin. 320672 Whitman Publishing Co., Racine, Wisconsin. Old Gypsy Fortune Telling Cards. No. 3013. 36, complete. Color lith., 89x58 mm, rc, Backs: Decorative panel, blue. 1940. The cards are - in place of alchemic signs in the quotated deck - captioned and numbered in the upper left corner. They take over most of the pictures of the Lenormand deck and also introduce new ones, eg No. 36 = "The Safe". Min. damaged OCase, folder of instructions, mint. FRANCE - NON STANDARD CARDS - Editions Face&Dos, Paris. 380284 Editions Face&Dos, Paris. BB Coyotte. Design: BB Coyotte (Bruno Belland). 32 + 2 EC, complete. Offset, 88x58 mm, rc, Backs: Portray of a young punk, in color. 2006. Bruno Belland (BB Coyotte) is an artist of the rock and its various tribes: punk, metal, gothic... All cards are illustrated. Limited edition of 500 decks. USA - NON STANDARD CARDS - Carta Mundi, Turnhout, for Aristoplay, Ltd., Ann Arbor, MI. 330557 Carta Mundi, Turnhout, for Aristoplay, Ltd., Ann Arbor, MI. Artdeck. Design: Harlin Quist. 52 + JJ + EC, complete. Offset, 100x65 mm, rc, Backs: Name of the deck between multicolored stripes. 1985. Quality reproductions of paintings by famous artists (Renoir, Seurat, Cézanne, Braque, Kandinsky, Miro...) on all cards. SPAIN - NON STANDARD CARDS - Asescoin, Madrid. 380485 Asescoin, Madrid. Baraja Claveria. Design: Josep Claveria i Bitrian. 60 + JJJ (all different) + 7 EC + title card, complete. Offset, 95x60 mm, rc, Backs: Ad of the Spanish playing-cards collectors association, grey. 2001. The deck celebrates the begin of the 21st century. It combines the Spanish and the French suit-signs in such a way that it is possible to play either with the ones or with the others. To this end there are 3 additional cards in each suit, a queen, a jack and a 10. The numerals display Spanish sights, the courts portray historical persons after famous paintings. Numbered edition of 325. Our copies are signed by the artist himself on the title card. ITALY - NON STANDARD TAROT CARDS - Lo Scarabeo, Torino. 200632 Lo Scarabeo, Torino. Golden Tarot of Klimt. Tarot Doré de Klimt. Design: Atanas A. Atanassov. 78 + title card + EC, complete. Offset, 120x66 mm, rc, Backs: Picture of a woman and decorative elements in the style of the Viennese Secession. 2005. The artist has ravishingly succeeded in capturing the opulent world of the Viennese Prince of Painters. The "Golden" in the name of the deck does not promise too little: all cards and the box are adorned with embossed golden designs which generate a truly brilliant effect. OCase, multilingual booklet (64 pp., English, Italian, Spanish, French, German), mint.